in Physical Therapy at Mercer University in Atlanta. Following graduation from Physical Therapy school, she decided to pursue a specialization in Orthopedics and completed an Orthopedic Residency at Mercer University. She joined The Sports Rehabilitation Center of Brookhaven in May of 2018 and is excited to be working in the community she grew up in. 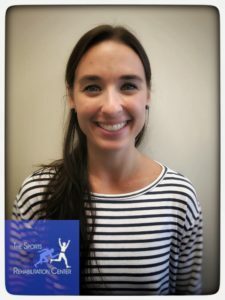 She is an APTA certified Clinical Instructor and has advanced training in trigger point dry needling, neurodynamics, pain sciences, and a Pilates-based rehabilitation approach. She enjoys working with athletes of all ages and has special interests in softball players as she played cumulatively for over 15 years. Dani is a member of the Georgia Physical Therapy Association, the American Physical Therapy Association including the Private Practice and Orthopedic sections, and American Academy of Orthopedic Manual Therapy (AAOMPT). She also is an adjunct faculty member at Mercer University assisting with entry-level Physical Therapy Students as well as Orthopedic Residents. Dani is a true Atlanta native. She has always enjoyed attending Braves and Falcons games and the many venues to enjoy outdoor music events Atlanta has to offer. She also enjoys running, hiking, camping, and spending time with her German Shephard Achilles.